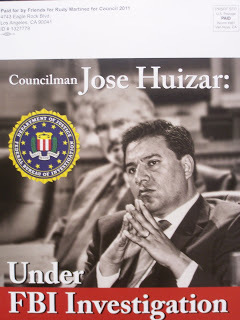 A clearly discombobulated and strained Los Angeles City Councilman Jose Huizar, makes his City Hall Horseshoe reappearance (with minimal comment), as new information regarding the extent of the FBI Investigation into the alleged Ethical and Criminal Conduct of the embattled CD-14 Officeholder, becomes known. 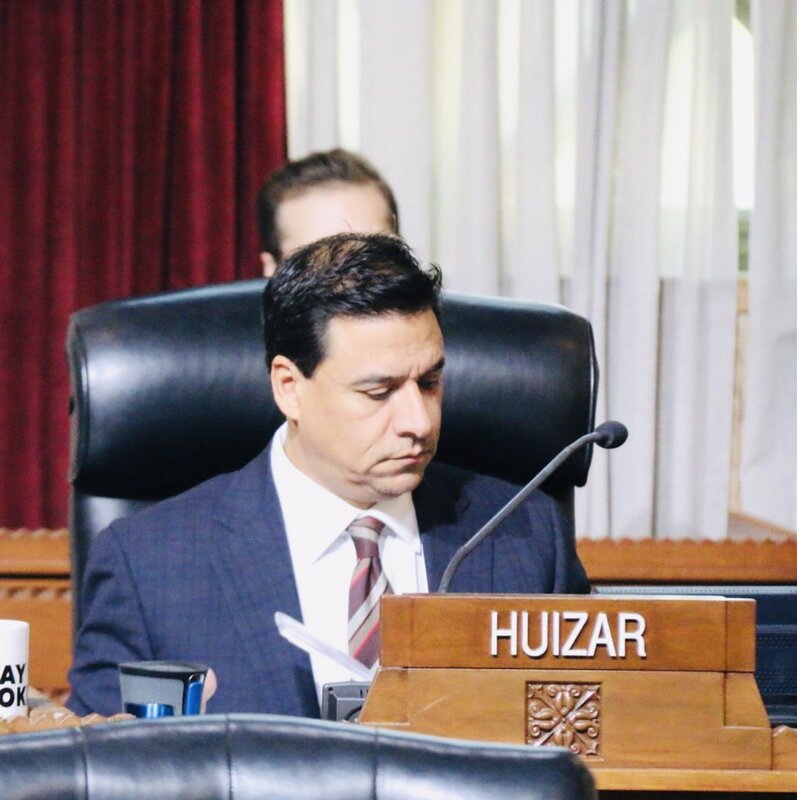 CD-14 City Councilman Jose Huizar returns to the City Hall Horseshoe. Photo via KNX 1070 AM. ** Blogger's Notes: "I'm here to do my job, I'm here to do my work", and with those words (repeated multiple times in response to Media questioning), a clearly discombobulated/strained CD-14 City Councilman ......., returned to the City Hall Horseshoe. 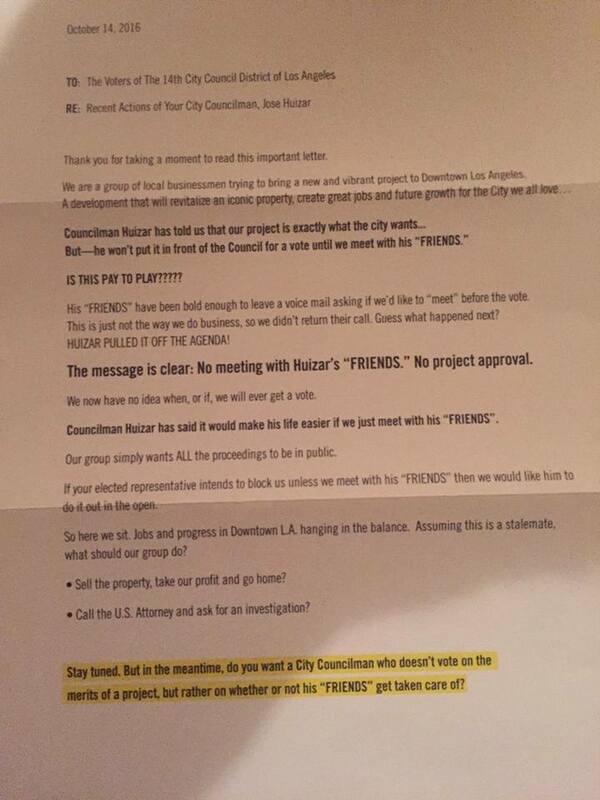 In recent weeks, as Legal Complaints of Workplace Misconduct, morphed into FBI Raids, the defiant bravado of the Princeton Graduate, turned embattled CD-14 Officeholder Jose Huizar, disappeared with him (along with his Committee Assignments), as he missed seven of nine City Council Meetings, that prompted speculation of a pending resignation. Instead, the assembled City Hall Chambers Regulars, along with an increased amount of Media, were given witness to a meekly, strained Politico ........., that clearly knows a worst, litigious future is forthcoming. Since the FBI's execution of seven Search Warrants, inquisitive members of the Media, along with our cyber brethren, have been pondering the other possible locations, within Los Angeles County, that were on the list of formal interest. In a CityWatch LA Missive, Writer Daniel Guss has a very plausible lead on a Downtown LA location of interest. But what you are learning for the first time right here is this: just hours before Mr. Huizar lost those committee assignments, the FBI quietly executed another search warrant at an unsecure office tower about a mile away from City Hall because, it is rumored, of his ties to enormous sums of dubious Chinese land development money that (according LA Ethics campaign donation records) may not only be tied to Huizar, but to Garcetti and Wesson, among others. 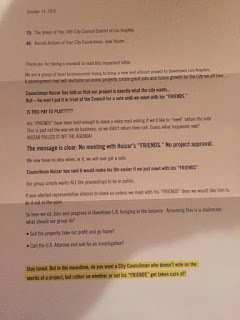 The Mayor Sam Blog has been privy to information that Councilman Huizar maintains (with city-financed materials) a secret, discreet location (that is even unknown to the #Richellary2020 Campaign) in the Historic Core of Downtown LA, which is used for "multiple-purposed activities (including those campaign-related)". It is very conceivable that "Developer Interests (as exampled by those mentioned in the Guss Missive)", would make available building space for a willing enabler ........., that formerly had supreme political oversight of "Los Angeles'es Skyscrap"-----Scott Johnson. The FBI Investigation of Jose Huizar continues. 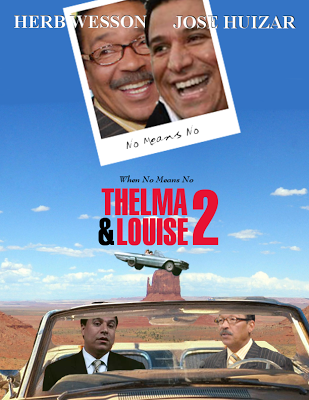 ........, a DOJ/FBI/IRS-produced Sequel featuring "Thelma Wesson and Louise Huizar"? 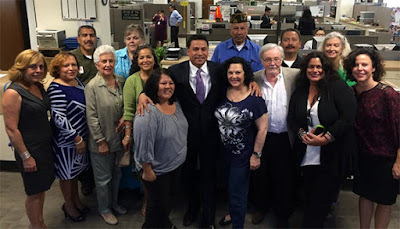 The assorted Huizzynistas of CD-14 and their Political Paramour ......, in better times. Labels: CD 14 City Councilman Jose Huizar, Daniel Guss, FBI investigations at City Hall, FBI Raids Huizar's Home. Downtown News Jon Reardie's "City Hall-oeen XI"